We will bring the live parliament updates starting at 10:00 am today (Wednesday, 2nd August). Please refresh the page to see the posts. (We thank you for following this live updates). 3: 41: Peter O'Neill is now the duly elected Prime Minister of Papua New Guinea. 3: 40: Prime Mininster elect is now sworn in by the Governor General Sir Bob Dadae. 3:22pm : Speaker suspends parliament until the ringing of the bell. Prime Minister elect and Member for Ialibu-Pangia Peter O'Neill is now taken to Government Haus for swearing in as Prime Minister of Papua New Guinea by the Governor General. 3:05: Head count underway : There is no PM nominee from the Opposition. 2: : 50 pm: Kua is not yet present in the chambers. Also the Speaker is yet to enter the chambers and take up his seat. 2:20 pm: Speaker's convey arrives at Parliament Haus. 1:20 : Speaker elect taken to Government Haus for Swearing in by the GG. 1:15: New Speaker vows to bring Parliaments integrity back. He looks forward to working with both sides of the parliament. He suspends parliament until the ringing of the ball. 1:07: Job Pomat takes Speakers seat. O'Neill congratulates him. 12:35 pm: SHP MPs sign declaration. Next is the Speakers election. 12:20 pm: MPs still signing declaration: Next will be election of the Speaker. 12:13: Nick Kuman signs Declaration Forms. That means, Lucas Dekena is not a member for Parliament for Gumine. 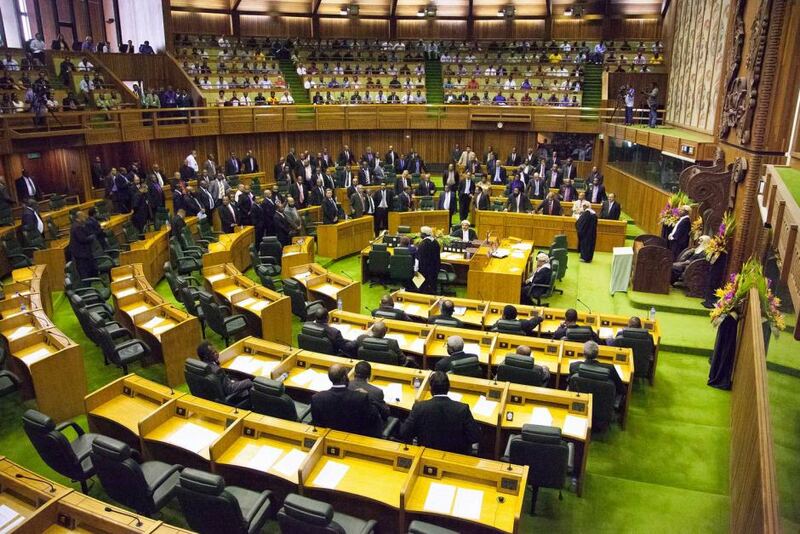 History in PNG Parliament: Two MPs take oath but only one signs the declaration form. 12:02: Opposition still standing: Injia reads order. Kua still yelling. 12:01: Sir Injua takes his seat. 12:00pm: Sir Injia still remain standing, all MPs also remain standing as the opposition team continue rowdy and noisy, bending seats and creating more noise. 11: 53 am: Government side and the Parliament Officials keep silent as Alliance group goes rowdy and noisy, pointing fingers yelling. 11:41: Team Alliance goes rowdy and no respect at all. 11:31 : Chief Justice enters the chambers and takes the speakers seat. 11:24: Kua keeps yelling at the Parliament clarks " kukus"
11:23: Kua asks Clark to remove, O'Neill, Marape, Kuman, Undualu, Duma, big shouting and yelling, parliament in chaos and uncontrolled yelling, pointing fingers at each other. 11: 16: Parliament Clark reads out list of members confirmed elected. 11:10 am: Parliament Clark enters and reads out the order. 11:07 am: Still delays as Dekena refuses to leave the Chamber. Parliament Police may use force to remove one of the MPs either Dekena or Kuman. 10:47 : Madang Regional winner. Peter Yama takes seat on the government side . Clark yet to provide list to the Chief Justice. 10:21: Lucas Dekena of Gumine is also seen seated in the Chambers so two members so far for the Gumine Open . One will be definitely removed from the chambers. Lets wait and see. 10:15: Members still waiting for Sir Injia. Nick Kuman is seen taking one of the seats. 10:11: Chief Justice yet to arrive. Security is very high around the parliament area. 10:06: The members are now waiting for Chief Justice Sir Salamo Injia to arrive and chair the parliament session to elect the Prime Minister. 10:03: PNC and its coalition partners enter the parliament chambers. They take the seats at the Government side. 10:00 am : Alliance Group Enters Parliament Chambers.